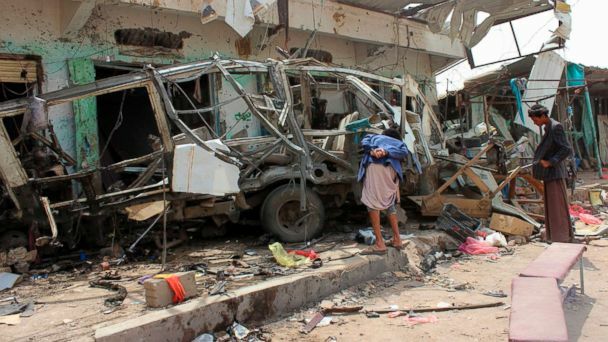 LONDON -- Houthi rebels welcomed a call for an international investigation into an airstrike that killed dozens of children traveling on a school bus in Yemen's Saada province Thursday. On Thursday, State Department spokeswoman Heather Nauert called on the Saudi government to conduct a "thorough and transparent investigation" into the attack during a press briefing. "This is something that is fresh, that just happened, so I'm not going to get ahead of any kind of investigation that may take place," Nauert said. The Saudi-led coalition has been fighting Houthi rebels in Yemen since March 2015. After the Houthis took over the capital of Sanaa and forced interim president Abdrabbuh Mansour Hadi and his government to flee the country, the Arab Sunni coalition, led by Saudi Arabia, launched a war to restore Hadi's government to power. Yemen is one of the world's poorest countries and the war has made conditions there much worse. More than 22 million people are in need of humanitarian assistance and more than half of the country's health facilities are out of service, according to the U.N. Office for the Coordination of Humanitarian Affairs.